Celebrate the Garden’s spring opening! Bring your surplus seeds to swap or simply come and pick up some new & heritage varieties. 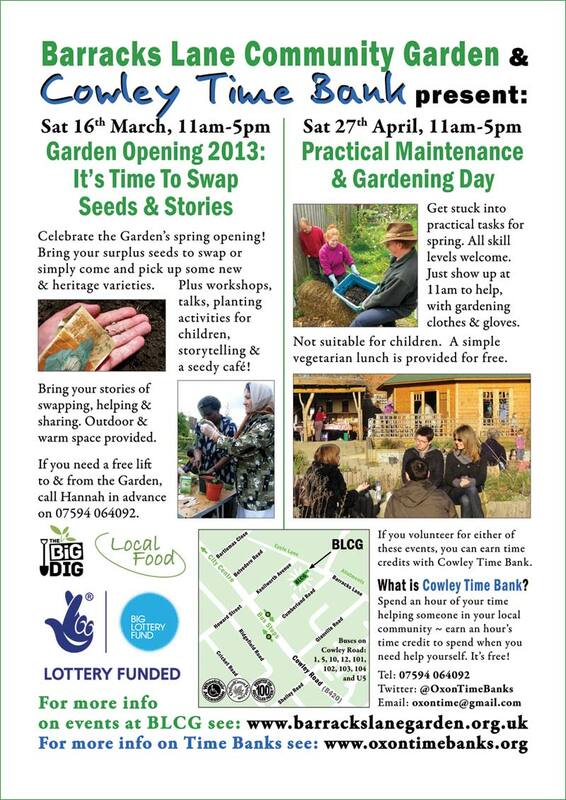 Plus workshops, talks, planting activities for children, storytelling & a seedy cafe! Bring your stories of swapping, helping, and sharing. Outdoor & warm space provided. If you volunteer for this event, you can earn time credits with Cowley Time Bank. What is Cowley Time Bank? Spend an hour of your time helping someone in your local community ~ earn an hour’s time credit to spend when you need help yourself. It’s free! This event is funded by the National Lottery through the Big Lottery Fund.